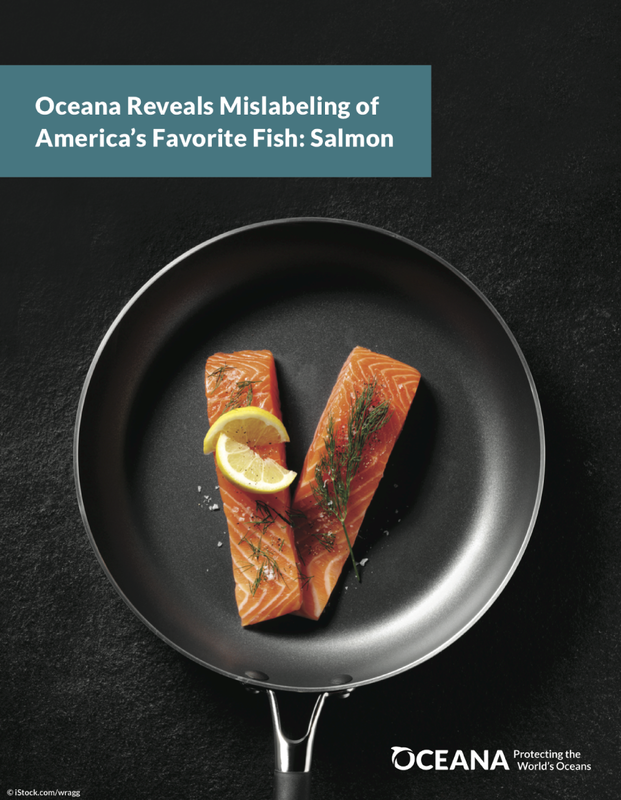 Oceana study reveals mislabeling of America’s favorite fish – salmon. Oceana collected 82 salmon samples from restaurants and grocery stores and found that 43 percent were mislabeled. DNA testing confirmed that most of the mislabeling (69 percent) consisted of farmed Atlantic salmon being sold as wild-caught product. Oceana found mislabeled salmon everywhere it tested, including 48 percent of the samples in Virginia (includes Virginia Beach, Norfolk, Newport News, Williamsburg, Richmond and Fredericksburg), 45 percent in Washington, D.C., 38 percent in Chicago, IL and 37 percent in New York, NY. Salmon samples were considered to be mislabeled if 1) they were described as being “wild,” “Alaskan” or “Pacific,” but DNA testing revealed them to be farmed Atlantic salmon; or 2) the samples were labeled as a specific type of salmon, like “Chinook,” but testing revealed them to be different species (in most cases lower-value fish). Oceana’s salmon samples were collected during the winter of 2013-2014, when wild salmon were out-of-season. This mislabeling rate (43 percent) differed greatly from Oceana’s nationwide survey in 2013, which found low rates (7 percent) of mislabeled salmon collected primarily in grocery stores at the peak of the 2012 commercial salmon fishing season, when wild salmon was plentiful in the market. Photos and b-roll avialable upon request. Please contact Dustin.